Full Speed Ahead for Superstar Caleb Following Sponsorship with Taylor Wimpey! 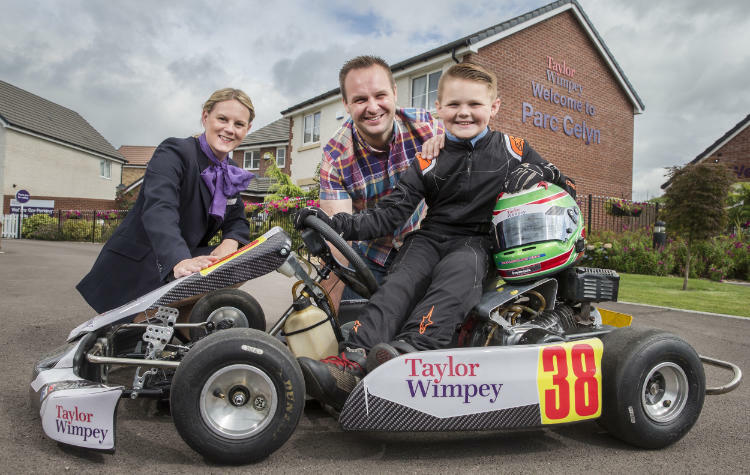 An incredible young go-kart racer from Pontypool, Torfaen, is set to make his debut in the Super One Series with another season of sponsorship from Taylor Wimpey South Wales. The leading local housebuilder, which is currently building a range of high-quality new homes at its Parc Celyn and Maes Brychiad at Edlogan Wharf developments, recently made its second donation to Caleb McDuff, who at nine years of age is the world’s youngest deaf racing driver on a professional career path. Before the age of two, Caleb lost around 90% of his hearing as a result of chronic ear infections, leaving him profoundly deaf and totally dependent on cochlear implants to hear. “When we were first told the news, we were absolutely devastated,” explains Ian McDuff, Caleb’s father. “Before this, we had sometimes struggled to get Caleb’s attention, but because he was our first child, we didn’t know any better, and as he was so young, neither did he. At just 18 months old, Caleb learned to drive an electric-powered toy car and eventually got behind the wheel of his first petrol-powered go-kart at the age of four. In 2014, he was selected to compete in the Bambino Kart Tour, a race series for drivers between the ages of six and eight, and finished 24th out of 40 at the end of his first season. Due to his custom-designed crash helmet, Caleb is unable to wear his cochlear implants on the track, meaning he is forced to race in complete silence. “Considering how far Caleb has come in such a short space of time,” Ian continues, “it’s just so amazing to see him racing around the track, and even if he always came last, I would still be incredibly proud of him. This year will mark Caleb’s first appearance in the MSA IAME British Cadet Championship, a class of the Super One Series for racers aged between eight and 13. Ian adds: “Caleb dreams of becoming the first ever deaf Formula 1 driver, but we’re not a well-off family and sadly the sport is set up in favour of those who have the money for it. I’d love to see him compete in high-level motorsport one day though, and this is something I don’t doubt he is capable of. Sara Taylor, Sales and Marketing Director for Taylor Wimpey South Wales, says: “We are absolutely thrilled to be sponsoring such an inspirational young person as Caleb once again. To find out more about the brand new homes at Parc Celyn, property-seekers should visit the Welcome Centre, located off Greenmeadow Way, Cwmbran, Torfaen, NP44 3XA, and open daily from 10am to 5pm. Alternatively, the Sales Executive can be contacted on 01633 744302. Alternatively, to stand a chance of securing their pick of the plots at Maes Brychiad, property-seekers should visit the Edlogan Wharf Sales Centre, located off Cilgant Ceinwen, Sebastapol, NP44 1RL, and open daily from 10am to 5pm, or contact the Sales Executive on 01633 744655. Further information about Taylor Wimpey developments across the region is available by calling 0292 053 4767 or by visiting the website at www.taylorwimpey.co.uk.